There are many ways on how you can invest in gold and there is good reasons for why you should start investing in gold. With over 17 trillion in debt, the Federal Reserve will keep printing money until our money becomes worthless. Gold is the ultimate place where you can protect your wealth. There is no mass production for gold and the supply is always limited. Gold might drop from time to time, but in the long run, it always rises. Gold has been risen from about $200 an ounce in 2000 to over $1,800 per ounce in 2011. That is a 900% gain in the 10 year period where the stock market produce little or no gain in the same period. However, gold pulled back in 2013 and is now currently trading at the price of around $1,300 per ounce. This is a great time for us to buy the dips for gold. Here are four ways that you can start investing in gold. 1. Buy Physical Gold - Buying physical gold is the most direct way to buy gold. You can buy gold coins, bars and jewelry at your local jewelers. Many gold dealers charge a high premium, so make sure you don't get ripoff. The average margin for retailers is about 1-3%. You can check out the latest gold price at goldprice.org, you will never want to buy the gold from a dealer that charges a premium over 10%. The higher the cost of your gold, the harder it will be for you to make a profit from it. If you pay a 10% premium, then gold has to rise 10% for you to just break even. You can store physical gold at your bank's safety deposit. It is not recommended to keep a lot of gold at home because it could get stolen. 2. Buy Gold ETFs - You can buy gold Gold exchange-traded funds (ETFs) as an alternative approach to invest in gold. The most popular gold ETF is the SPDR Gold Trust (GLD). The benefits of buying Gold ETFs is that you don't have to deal with the hassles of buying and storing physical gold, and you don't have to worry about getting ripoffs by your local jewelers. You can easily buy Gold ETFs online with a trading account with any of the stock brokers. It is the same as if you are trading stocks online. IAU and SGOL are two other gold Gold ETF that you can consider, but they are not heavily traded like GLD does. However, there are drawback with Gold ETFs and there are risk involved owning Gold ETFs. First of all, EFTs charge a 0.25% to 0.50% fee, so the longer you own your ETFs, the more fees that will be charged from your shares. You will also need to pay tax when you make a profit from your investment. 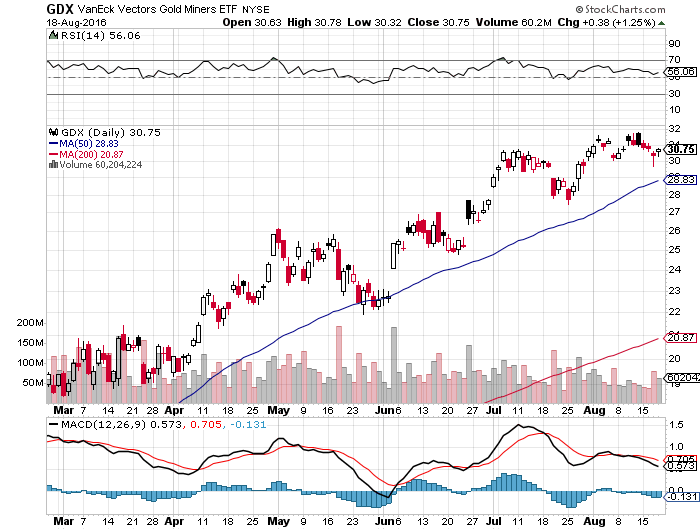 Here's how the Gold Miners ETF GDX performing for the past few months. 3. 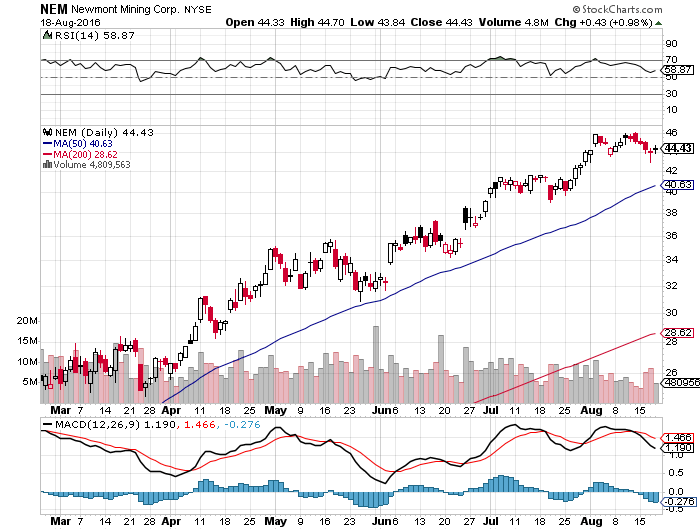 Gold Mining Stocks - Gold Mining Stocks is another way to invest in gold. However, it is more risky than owning physical gold and Gold ETFs. Gold mining stocks are traded just like any other stock and the price of gold mining stocks is much more volatile than gold. When gold price rise or drop 10%, gold mining stocks could rise or drop 20%-30%. It requires more skills for you to pick the right gold stock to invest in because many small gold mining companies go out of business. You will want to stick with the leaders in this industry if you do decided to invest in gold mining stocks. Here's how the gold mining stock NEM performing recently. 4. Gold IRA - Gold IRA is an Individual Retirement Account (IRA) with physical gold in it. You can have other type of investments along with gold in your Gold IRA such as silver, platinum and palladium. You can even include gold ETF or stocks and shares in gold mining companies in your Gold IRA. Gold IRA is a self directed IRA where you control your gold. It is similar to a traditional IRA where you enjoy tax free benefit and there is no penalty when you rollover your existing retirement plan such as 401k or precious metals IRA to a Gold IRA. The most important factor for a successful Gold IRA is to choose the right company. You need to work with a company that specializes in retirement plans and government regulations.